A 67 year-old female (90-kg) is brought into your emergency department because of increasing confusion. As the nursing staff is hooking the patient up to the monitor, the patient’s daughter comes into the room explaining that the patient has a history of atrial fibrillation, CHF, renal failure, and lives at home with the patient’s husband. Over the past several days, the patient has had increasing confusion, weakness, malaise, and anorexia. The patient’s daughter also hands you a medication list that includes furosemide, digoxin, sublingual nitroglycerin, and baby aspirin. Vitals are bp 94/54, RR 16 breaths per minute. Exam reveals elderly appearing woman in moderate distress with clear lungs sounds and irregular tachycardic heart sounds with S3. Extremities have 1+ pitting edema. 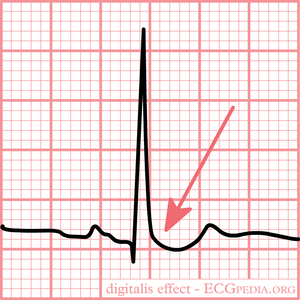 Electrocardiogram is obtained and is shown below. What are your next steps in management? 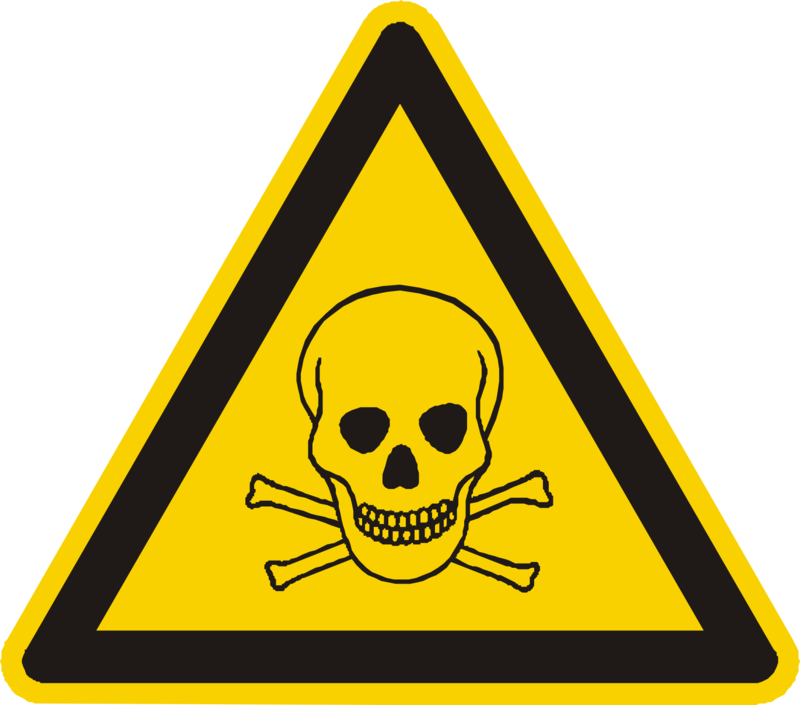 Digitalis Toxicity: What is it? A classic (board-tested) symptom is visual disturbances, specifically halos around objects and/or yellow or green color aberrations. Also blurred vision. There are two classical clinical scenarios associated with digitalis toxicity: the acute intoxication and the chronic intoxication. Do not gastric lavage. 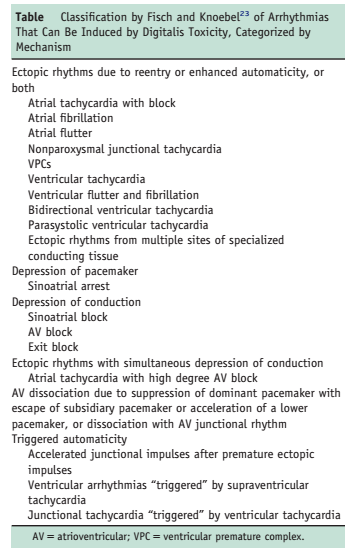 this can increase vagal stimulation leading to asystole (which is bad). Do not use bretylium, procainamide, isoproterenol, propranolol. Just don’t. Our case revisited. IV line, pulse oximeter, cardiac monitor were placed. Potassium was 4.5. Patient did not take her dose of dig yet today and her level was 3.2. She experienced intermittent episodes of hypotension and was deemed to be hemodynamically unstable and was administered (3.2 * 90-kg/100)= ~3 vials of Fab. She was admitted to the ICU for digitalis toxicity after an extensive work-up was obtained in the emergency department. Boyle, J. S. and M. A. Kirk (2011). Chapter 187. Digitalis Glycosides. Tintinalli's Emergency Medicine: A Comprehensive Study Guide, 7e. J. E. Tintinalli, J. S. Stapczynski, O. J. Maet al. New York, NY, The McGraw-Hill Companies. Levine, M. O’Connor, A.. (2013, 06/06/2013). "Digitalis (cardiac glycoside) poisoning." Retrieved 07/03/2014, 2014, fromhttp://www.uptodate.com/contents/digitalis-cardiac-glycoside-poisoning?source=machineLearning&search=digoxin+toxicity&selectedTitle=1~85&sectionRank=1&anchor=H4#references. Ma, G., M. Pollack, et al. (2002). "Response." 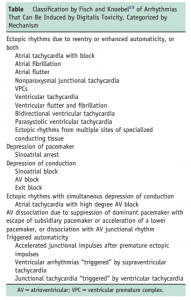 Journal of Emergency Medicine 22(3): 1p. Shah, S. and J. M. Criley (2012). "Digitalis Toxicity: A Fading but Crucial Complication to Recognize." American Journal of Medicine 125(4): 7p.